Full details on the 2014 Toyota Yaris Hybrid have been revealed. On sale now, the car benefits from revised kit, and a new grading structure. Active and Icon Plus grades replace the previous T3 and T4, while the popular Trend specification replaces T Spirit as the range-topper. Trend models benefit from a raft of cosmetic tweaks, including the introduction of a black C-pillar decal that creates the illusion of a floating roof. A tailgate spoiler gives a purposeful look at the back, while 16-inch machine-faced alloy wheels add even greater road presence. Inside, occupants are greeted by part leather seats, and to make life easier for drivers the Trend is equipped with keyless entry and push button start. Auto headlights and rain sensing wipers, plus an auto-dimming rear-view mirror also feature. All-round power windows round-off the impressive kit list. 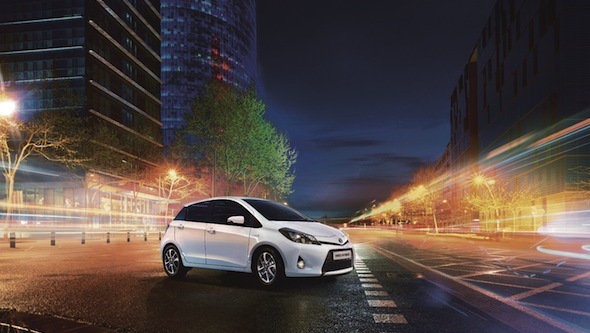 The Protection and Style Packs that are available on selected Yaris variants, are also available on the Yaris Hybrid Icon Plus and Trend models, as is Toyota’s Touch & Go multimedia system. More information on the option packs is available here. Prices for the 2014 Yaris Hybrid range are listed below. If you would like to get behind the wheel of a Yaris Hybrid, leave us a comment below expressing your interest and we’ll be in touch.